The traffic lights which can be seen at every crossing in Japan persuade visuality, cost and durability and control the traffic environments such as roads and its design was not considered important. But there was recently a change in traffic lights world. A LED light traffic light, which achieved energy efficiency and environment protection, came into the scene. The luminious intensity distribution on the display is even and the display is easy to be read off but the entire form of it follows the old traffic lights. In contrast, CUBIT can be considered as a proposal of a new design which matches a modern city space. The form is designed not to be ruined even if the number of lights increases from 2 to 4. Furthermore, the lights do not simply blink but the display of words and symbols became easier thanks to LED and show a possibility to contribute to information communication in case of emergency. 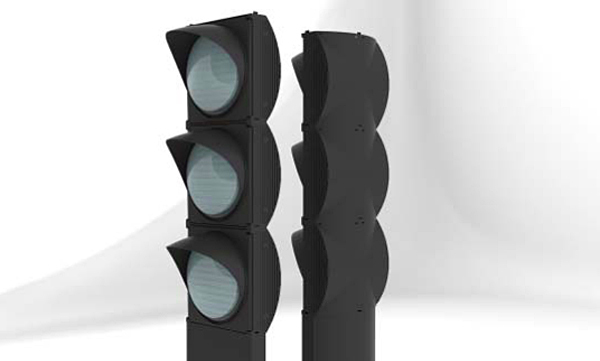 Traffic lights have an important function in traffic environment but, in many cases, the design was looked over. Normal drivers just focus on the colour and pass by the traffic light with keeping a safe drive in mind. However people who are walking sometimes pay attention to the form of a traffic lights and the balance with the surrounding and be surprised by the dreary of a crossing.・ It is expected that CUBIT, which is still in a experiment stage, will reach the best design and improve aesthetically the near future traffic environment as a mass product.